It is a tough call to identify the most appealing urban spaces in all Europe, for there are many contenders for such a title. The Mezquita in Córdoba springs to mind. Or a myriad of Italian town squares. There we might plump not for one of the famous piazzas of Venice or Rome, but possibly for the Piazza Vecchia in Bergamo’s upper town. Presided over by the classical library at the north end and the Romanesque church of Santa Maria Maggiore at the south, the Piazza Vecchia is a hotchpotch jumble of buildings that somehow meld together to create a symphony in space. Even the Palazzo della Ragione which arrogantly juts across the middle of the square is absolutely perfectly poised in the ensemble. 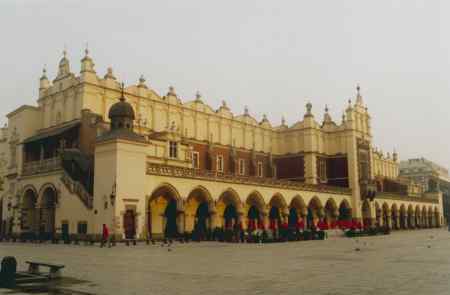 But if really pressed to identify one spot, a precious place that might carry the crown, it would be hard to pass over the claims of Kraków’s main square. The Rynek Glówny in the great Polish city is, quite simply, one of Europe’s most magical urban spaces. It was already in the premier league of city squares in mediaeval Europe. The whole piazza is bound together by the arcaded cloth hall that dominates the middle of the square. And, like all the best urban spaces, it has not one but a dozen focal points: the asymmetric towers of the Mariacki church, each topped by a motet of spires; the green dome of the tiny white church in the southeast corner of the piazza and the nearby serious statue of Poland’s great romantic poet, Adam Mickiewicz; and then, beyond the cloth hall, an isolated tower, the remnant of the old town hall. And around the square a clutch of little renaissance palaces interspersed by more modest dwellings, many of these happily now converted to restaurants and cafés, some affording the option of al fresco dining down on the square itself, or elegant upper storey rooms, all white tablecloths and chintzed charm, whence one can quietly spy on the crowds in the square below. Kraków has many different demeanours. On spring days a dozen school parties from all over Poland might mingle with backpackers in search of a smattering of culture and the cheapest pizza in town. And on an chill November night, when, as the winter’s first snow flurries sweep little waves of white over the floodlit cobbles, there might be nothing better than to sip a glass of bone dry tokaji szamorodni in the cushioned comfort of an upper room overlooking the deserted square. The Poles, not generally noted for any great affection for wine it has to be said, seem especially blessed in having secured for themselves such a generous portion of Hungary’s output of this amber dry wine. Of course, the vote for Kraków is influenced by the city beyond the square, and by the appeal of the wider region. And Kraków clearly has other charms beyond its precious square. To the south of the square are Wawel Hill and Kazimierz, the onetime Jewish quarter, where nowadays many folk who know no Yiddish make a good few shekels out of klezma music and selling gefilte fish and kneidlach to gentiles from western Europe and North America. Certainly those in search of good food must search outside the Rynek Glówny. After an amiable day of people-watching in and around the square, there is no better place to retire for dinner than the polished elegance of the Farina Restaurant (on ul. Sw. Marka at the junction with ul. Sw Jana). Tucked away here, you will find the very best of modern Polish cuisine, accented by imaginative Mediterranean flavours. Sleek wooden floors and stylish orange and mauve menus set the tone in a restaurant that slides seamlessly from pierogi to duck with a good choice of fish en route. Their chic Farina Restaurant website is enough to whet the appetite. The churches in and around the Rynek Glówny are of course utterly memorable, and the intricately carved Veit Stoss altarpiece in the Mariacki Church is a sumptuous late Gothic marvel that alone might justify a special journey to Kraków. One of my favourite piece of Kraków design, however, is the much more modern stained glass windows and murals in the Franciscan church which stands opposite the Archbishop’s residence just south of the square. The work of Stanislaw Wyspianski, Poland’s answer to England’s William Morris, these windows and drawings are little more than a hundred years old, and represent the finest tribute to the vitality of the mloda polska (‘Young Poland’) movement which did so much to revitalise Polish design from the late 19th century. Wyspianski’s God the Father essay in stained glass in the Franciscan church, over forty panels in all, is a bold riot of azure and aquamarine, shades of gold, and towards the base, threads of velvet red. Religious symbolism is everywhere in Kraków, and is no less evident in the city’s hinterland. Insofar as casual visitors venture outside Kraków at all, it is to the Nazi death camps at Auschwitz-Birkenau, located at Oswiecim about 60 kilometres west of the city, or, for an excursion that tugs less at the conscience, to the salt mines at Wieliczka, about 15 kilometres southeast of Kraków. But there are other options. Nowa Huta, for example, which is a mere thirty minute tram ride from central Kraków. Moreover, there is one of Europe’s most exceptional cultural monuments at Kalwaria Zebrzydowska. Here visitors will find, on the gentle slopes of the Beskidy Hills, a quite extraordinary Baroque landscape park which is without peer in all Europe. The park at Kalwaria, a name which means ‘calvary’, was a by-product of a particular moment in Poland’s political history. 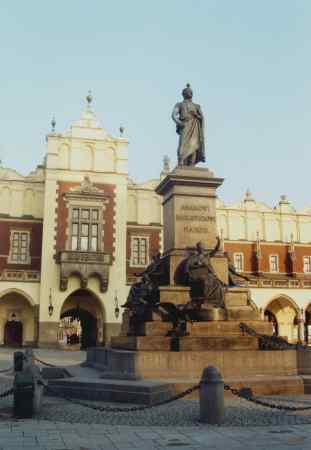 In 1596, the city of Kraków suffered an extraordinary setback when the royal capital was suddenly moved from Kraków to Warsaw. Kraków took its loss of status hard and the then governor Mikolaj Zebrzydowski turned increasingly to a life of prayer. In 1600 he built the chapel of the crucifixion on Zar Mountain at the heart of Kalwaria. 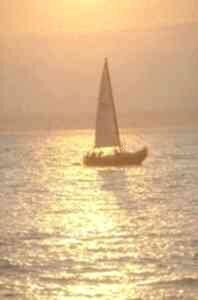 It became a place to which he would retire, often for days at a time, to meditate. Zar Mountain came to symbolise Golgotha, and, in the years thereafter, a total of forty four chapels were constructed on the surrounding hillsides and in the intervening valleys, and the entire landscape was sculpted to recreate the holy sites of Jerusalem and its environs. The whole endeavour was doubtless helped by the publication in 1584 of Christian Andrichomius’ excellent illustrated map of Jerusalem at the time of Christ. If Zar Mountain was Golgotha, then the nearby Lackaranska Mountain represented the Mount of Olives. Two rivers dissect the park, the Skawa and the Raba, and two perfectly positioned mediaeval castles, one at each end of the park, complete the ensemble. The parklands are exquisite, a delicate balance of French Baroque formality, Italian Renaissance vision and Mannerist freedom. And everywhere the quite extraordinary vistas: here a glimpse of Kraków to the north, and there panoramas of the snow capped High Tatras to the south. 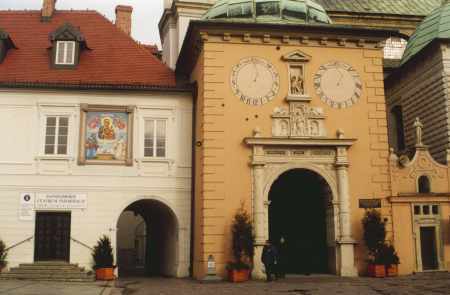 In the early seventeenth century, while work on the Kalwaria park and chapels was still underway, the care of the whole complex was entrusted to the Franciscan Friars Minor, who in Poland are normally called the Bernardines, and it has remained in their custodianship ever since. Kalwaria Zebrzydowska today is open in its entirety to the public. It is one of the finest European examples of a religious symbolic landscape, but even for those with no confessional sympathy for Christianity, a visit to Kalwaria can be the highpoint of any stay in Kraków. There is another rewarding excursion from Kraków, and one which comes with an even heavier dose of religious symbolism than Kalwaria. And that is northward from the city to Czestochowa. It is a good stretch, about 130 kilometres, but on a very good highway, and with good bus and train connections. The Jasna Góra monastery, symbolically placed on a hill at the end of Czestochowa’s main boulevard, houses the most revered icon in Polish Catholicism. Nowhere else are religion and expressions of national identity so consummately intertwined as in Czestochowa. Black Madonna icons or statues are actually not that rare. France alone has more than fifty of them. Even England has two (at Mayfield in Sussex and at Walsingham in Norfolk). But few have been enshrined with such rich meaning and symbolism as that at Czestochowa. You don’t have to believe that the Black Madonna here really was painted by St Luke almost two thousand years ago to be impressed by the cultural antics that envelop Jasna Góra. Few Polish pilgrims to the shrine really worry about the exact origins of this Byzantine icon. For them, the icon captures, more than any other artefact, the quite extraordinary devotion that many Poles have to the Madonna. And for many the serenity of the Black Madonna says something about the Polish spirit of endurance. Visit on one of the great Marian feasts of Catholicism and endurance is much in demand for those who want to view and pray before the icon. On such days, the faithful queue for hours. The icon apart, the Jasna Góra complex takes a hour or two to explore, with a renaissance Knights’ Hall, a library rich in frescoes, the basilica itself, and some beautiful surrounding ramparts and parkland. But most curious of all is the little Sacred Chapel of the Polish Nation. At my last visit, a very sincere retired shipyard worker from Gdansk said that the urns in the chapel contained earth moistened with the blood of workers from Poznan and Gdansk who had been killed by soldiers or armed police during the suppression of riots. Who knows? In a region as rich in symbolism as southern Poland, fiction is sometimes much more important than fact. If you enjoyed reading the above article then you will probably also enjoy Sicily by Nicky Gardner, and Northern Cyprus, also in Europe, and our latest articles covering the Orinoco Delta, La Mata, Marbella and Beijing.